1 Federal Census, TN, Davidson County, 1940, Dist. 7, E.D. 19-26A, Sheet 11B, Image 22 of 38, Ancestry.com (Online Census Images). 2 The Tennessean (Nashville, Tennessee), 01 MAY 2011, Obituary for spouse Gloria Dean Napier Grant. 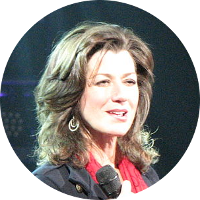 3 IMDb, "Amy Grant Biography", (accessed 10/26/2015).